Luxury Steading Lodge in Highlands Scotland a perfect base for your holiday in Inverness-shire. Find out more about Luxury Steading Lodge below. Luxury 19th century holiday lodge rurally located in an area of outstanding natural beauty yet within easy distance of Inverness. Five star accommodation sleeping up to 12, with reception rooms, bedrooms and bathrooms all finished to a high standard. Good ratio of bathrooms to bedrooms. Warmed in the cooler months by oil central heating and open fires. Within; -Accommodation is made up of 6 bedrooms and 6 bathrooms -Superb drawing room with open fire and French windows opening onto the courtyard -Spacious, elegant dining room seating 12; Separate sitting room with TV -Well-equipped, modern, country style kitchen with aga -Plenty of outdoor space for children Perfect for: Families, mixed couples, fishing and walking groups and outdoor enthusiasts wanting a luxurious venue in a rural, tranquil location. Please note: This property does not offer weekend rentals. Luxury Steading Lodge is family friendly self catering. We have the following details listed regarding Luxury Steading Lodge accommodation accessibility but we would recommend that you always confirm these prior to booking with the owner or operator. Luxury Steading Lodge is a great base to explore the wonders of Inverness-shire and you will find plenty of activities near by. 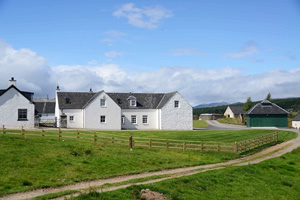 Luxury Steading Lodge is at Drumnadrochit, Inverness-shire. The nearest train station is Inverness. The nearest airport is Inverness. Check out the map below for directions, use the controls to zoom in. If you have stayed at Luxury Steading Lodge why not add your thoughts, comments, pictures to our Facebook page? Don't forget to add the name/town/page link to your comment so its attributed to the correct place. Please keep it polite, we are sensitive souls! Find Cottage Holidays works closely with independent cottage owners and leading holiday travel operators to provide you the widest choice of self catering accommodation across Scotland. Luxury Steading Lodge in Inverness-shire is available through: Scotts Castles. Stayed at Luxury Steading Lodge?